You have a life. We understand that you likely won’t be able to quit your job or take precious time away from your family responsibilities during the week to attend school full-time. Most dental assisting programs offered by vocational schools require that you attend classes during the week. 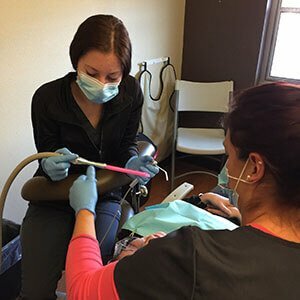 The National Dental Academy dental assisting course is just 10 Saturdays, so you can keep your job and continue with your life while you work towards becoming a dental assistant. What’s a typical Saturday of NDA class like? Morning lectures are followed by afternoons of practical, hands-on dental assisting training. You’ll learn how to work with all the instruments, equipment, and materials commonly used by dental assistants in most practices. National Dental Academy program graduates also benefit from a strong knowledge base that is strengthened by home study each week. National Dental Academy campuses are unique compared to most traditional dental assisting programs because they are located in real-life dental offices. We encourage our students to arrange on-the-job training with another dentist in their community, as well. Obtaining your education in the same environment you’ll be working in after graduation means that you’ll be even more prepared and confident in your new profession as a dental assistant. Training is provided by experienced, skilled dental assistants with real-life, chair-side dental practice knowledge. 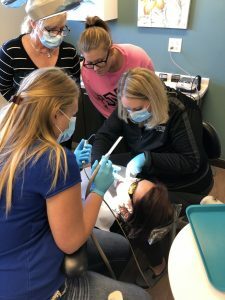 The National Dental Academy of Wisconsin team choose their dental assistant course instructors with extreme care, keeping your education, your career, and your future in mind. 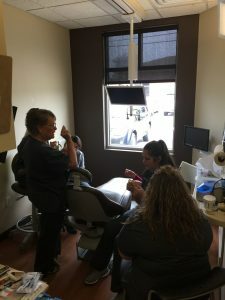 We have been teaching Dental Assistants for about nine years and nothing makes us more proud than watching our students work hard, graduate and take their places in the dental field often times changing their lives for the better! Come and join our team!